The granite slabs that we bring in are quarried from all around the world using two methods; drilling and jet piercing. Once quarried, the granite blocks are then cut into slabs by a high speed, diamond tipped gang saw. Newly cut slabs are then surfaced polished and put into a container in bundles of 8-10 and shipped around the world. From there we hand select each slab that we purchase. Every project that goes through our shop is hand fabricated to the finest detail by Custom Granite Works highly trained staff. Our craftsmanship and attention to detail is what our clientele have come to expect, and is the reason why so many people highly recommend us or have returned to us use time and time again. Our trusted installation crew have the knowledge and experience required to ensure the finishing touches are the precise and perfect fit. I simply couldn't use any other fabricator. 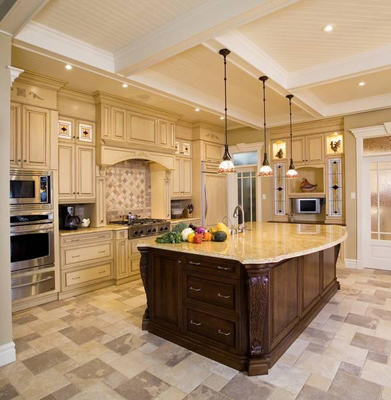 Custom Granite's attention to detail and customer service is unparalleled.